The Poster Session is on Thursday, June 4, from 4:15 pm – 6:15 pm on the second floor of the Library. Please join us for wine and hors d’oeuvres, and raffle prizes. Empire State College is undergoing a massive academic reorganization resulting in a move for our librarians from Information Technology Services to Academic Affairs. This reorganization has rekindled the focus on “student success” and new opportunities for the library to establish and assess information literacy outcomes. In my role as co-chair of the planning committee for the college’s Institute on Mentoring, Teaching & Learning, I have worked with participants examining better ways of preparing our students to succeed to connect those three projects to the library, and to the college’s larger discussion on this issue. This poster will illustrate those connections. Information literacy instruction is often taught in an academic setting with academic goals in-mind. Two librarians set out to unusual locations on-campus to catch students’ attention and demonstrate how information literacy, as a life skill, applies in their academics, professional development, and every-day living. One program partnered with the campus Academic Peer Mentors (APM) to reach freshmen in their residence halls and the other connected with Eta Sigma Gamma, National Health Education Honorary. Both programs provided a place where liaison librarians could meet with students informally to provide instruction organically based on students’ direct feedback. The establishment of more professional credentials within the field of academic librarianship is an important initiative within the occupation; however, the examination of attitudinal attributes associated with professionalism is left primarily unacknowledged. The purpose of this poster is to discuss a proposal to study attitudes toward professionalism in employed academic librarians. The proposed study will utilize an online survey to examine the differences and relationships among degrees of professionalism, including specific variables such as faculty status, educational credentials, and non-library subject specialization. The results of this study appeal to academic librarians, close the gap within the research literature concerning attitudinal attributes and their influence on the profession, and should provide a benchmark with which to compare and determine the most beneficial credentials needed by academic librarians to achieve professionalism. What is the art of writing a book review? Succinctly articulating a book’s main selling points, presenting a clear evaluation, and the occasional witty quip are just some of the many components in a reviewer’s bag of tricks. Finding venues to publish reviews (journals, review outlets, blogs) suited to your professional and individual areas of expertise also requires savvy. This presentation will demonstrate how book reviews can be effective tools for a librarian’s collection efforts, an avenue of exposure for one’s library, and a vital artistic and creative outlet in a profession that doesn’t always allow time for those pursuits. The lure of distractions can entice even the strongest of student wills in a computer classroom. Research requires strategic thinking and ordered planning to drown out the noise of online diversions; this presentation presents ways to capitalize on the natural overlap of research, communication, and social media by employing game strategy to lead learning outcomes. Instead of silencing social media, this activity incorporates Twitter as a platform to introduce information literacy concepts and participatory practices employed in scholarship. At the end of the session, attendees will have a core set of digital tools and concepts that can be quickly implemented. Interactive storytelling is a highly successful drama strategy used by the Creative Arts Team with its residency and mentoring programs in educational settings. The process for a librarian involves: learn an informative piece, expand on that piece to meet the needs of the audience, and add in points for listeners to participate – both verbally and physically. The points of participation actively engage the audience, support literacy skills, and the facilitator and by association the participants embody multiple roles throughout, utilizing different attitudes and physicalities that enable exploration of different points of view and aspects of the information literacy process. Libraries around the United States are all too aware of the risk that copyright can have on their operations. Many libraries have begun limiting their services as a result of that risk. Instead of moving away from services such as electronic reserves, Binghamton University Libraries are using that risk to drive traffic into the library and promote its services. Through a study of University wide use of Blackboard, the Reserves department was able to assess the risk of non-compliance to the University and establish a set of best practices using established workflows for vetting documents for copyright. In response to the chronic shortage of STEM librarians, the Brooklyn College Library targeted STEM undergraduates with an internship program – the Science Information Internship – in the Fall of 2014, to foster interest in science librarianship and to promote the ‘art of librarianship’ to students who are in the midst of considering their career path options. The presenters will discuss the genesis, curriculum development, execution, and outcomes of the pilot internship, with an eye to address challenges and next steps, and to offer tips for implementation for other interested libraries. 3D printing is an art that requires a great deal of organization. This poster will help identify some of the time management, staffing, troubleshooting, and administrative challenges we’ve faced, as well as the supplies and tools we’ve found useful along the way. We’ll share what we’ve done, as well as what we wish we had done differently. At academic libraries, patron needs are changing rapidly while budgets languish. As such, librarians are faced with a problem: how can we meet the increasingly complex needs of a patron community on a shoestring budget? 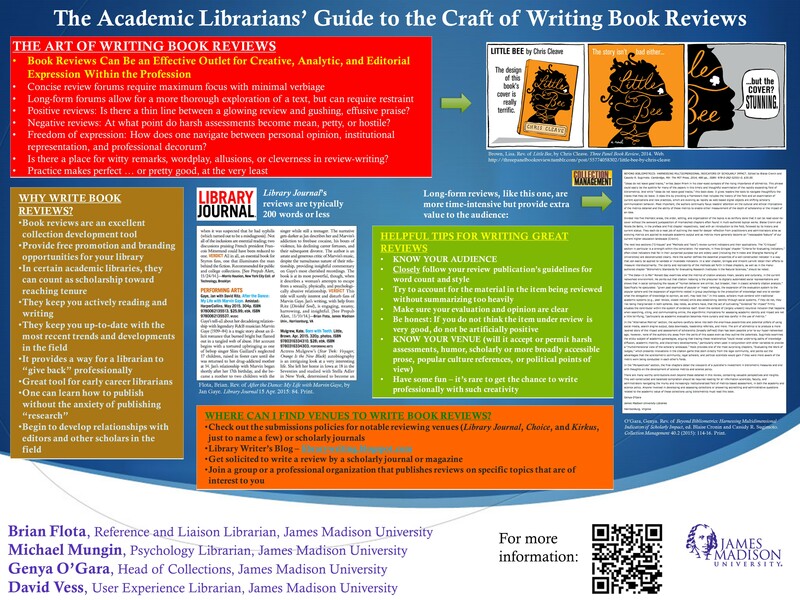 Using Sarah Lawrence College as a model, this poster will focus on using free online tools to improve both collection development and instruction services in the small liberal arts library. This poster will discuss how we’ve used Tumblr as an acquisitions tool and Youcanbookme to schedule research consultations as two innovative and low cost tools that expand the reach and ease of library services. This poster presents the preliminary findings of a study in which art history and classics students were asked to perform descriptive tasks for art images from Cornell University Library’s Images for Teaching Collection. This poster supplements the presentation on the same topic which covers both the study’s design and methodology as well as a brief discussion of the findings. The IDS Project Poster will share information on existing programs and services, including the Mentor Program, the Regional User Groups, the Online Learning Institute, IDS Logic, and the national IDS Project membership program. The poster table will also include forthcoming IDS initiatives, including new rules and services for IDS Logic and the upcoming IDS Project Conference. We will discuss the ever evolving practice of teaching Information Literacy at a distance through an online self-paced tutorial. This poster will review the different stages of hosting sites, the changing appearance, the pros and cons of each stage of development, and the constant work to keep an online tutorial for information literacy up to date and consistently improving. Salons organized by librarians can transform patrons’ perception of the library by revealing that that the librarians (and the library) can do much more than just provide research assistance. These events form a unique and innovative outreach program that fosters a community of scholars and librarians while simultaneously drawing attention to library services. Sponsoring events that highlight research on hot topics and promote scholarly interaction is a creative way to channel the intellectual curiosity inherent in librarians. In today’s Academic Library, exciting opportunities exist to support the college’s learning goals and celebrate the work of our students and faculty. Hamilton College’s Apple & Quill: Creative Arts at Burke series features creative readings by students and faculty, analog maker-space activities such as book making, and collaborative workshops. This series forges personal connections between faculty, students, and the Academic Resource Centers, and in the process draws people into the physical building and engages the community in energizing ways. My poster will present a small group activity in which students examine informal, colorful hand-drawn posters to answer and discuss questions about authorship, agenda, argument, and intended audience, as a gateway to addressing the same critical questions when confronted with the greater complexity of websites. Research on the open web is a vital part of students’ information-seeking lives and will continue to be after college; activities such as this encourage students new to research (I have used it with high school students, traditional-age students, adult learners, and English Language Learners) to build lifelong critical habits of thought. P17. Providing Evidence Based Research for Theatrical Productions using online techniques. Providing historical context for theatrical productions is crucial to the creative processes of transforming the written word into a live performance. The poster will illustrate how the integration of articles, film clips, virtual presentations and visual clipboards innovate the rehearsal process as the actors brings characters to life. Gnome Bibliomancer. High Elf Loremaster. These are just some of the personas adopted by our librarians over the last year as part of a new Personal Librarians Program. Introduced as a way to better connect with students, this program includes trading cards representing each of the librarians and their specialized skills. Our poster will provide a glimpse into how the program was developed, from the crafting of persona caricatures to marketing and assessment–including images of the finished products. It will also provide best practices for any other libraries who are considering a similar program, and information on how we hope to expand the program as it moves into its second year. In this poster, we will present the process we used for implementing a successful student-based logo contest, including our decision to partner with a graphic design professor to target the contest to his students. We will describe how we structured the project such that it replicated, as closely as possible, an actual design bidding process in which the designers met with the client (the library) multiple times, conducted research, responded to client feedback, and presented their final designs. We will explain the benefits of structuring the project this way, as well as some of the struggles we faced along the way (and suggestions for avoiding them). Finally, we will share final logo designs, student and faculty feedback, and our plans for future collaborations with these students and the graphic design department in general. P20. Biology Information Literacy: Can We Trust Non-Librarians with our Curricula? Becoming a new supervisor comes with its own set of responsibilities. It requires creativity, imagination, confidence, and communication to survive and emerge victorious in an unpredictable environment. But how does one make the transition from team member to leader while balancing the needs of the many with the needs of the few? How can you design a hospitable district for your direct reports while “managing up” in a challenging political arena controlled by others? This poster session will illustrate methods for merging academically acquired leadership skills with practical experience won the job. To support collection development practices, Faculty Profiles and Faculty Topic LibGuides were created for the departments History, International Studies, Modern Languages and the Performing Arts. The profiles provide an overview of faculties’ research areas, their publications as well as an overview of the classes they teach. The guides are easy to create, easy to share with faculty and librarians and are very useful for collection development purposes.